My first day there, I visited two of the more touristy attractions on the outskirts of Tainan. The first is known as Moon World 月世界 and, as the name suggests, is a very strange geological feature that resembles the moon. Unfortunately, even though I’m definitely a fan of the geology of Taiwan, I didn’t find Moon World to be all that interesting. The park there has set up a paved track to walk around that will take about an hour to complete. 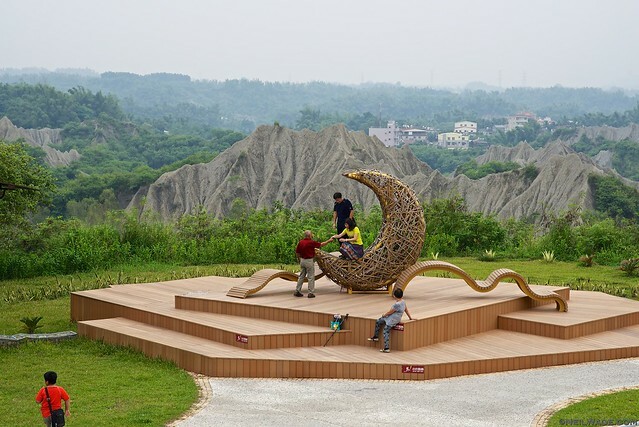 For a more in depth read of Moon World and the other “Badlands” of Taiwan, read Richard’s or Michael’s excellent blogs. Visitors pose for photos at one of Moon World’s vistas. 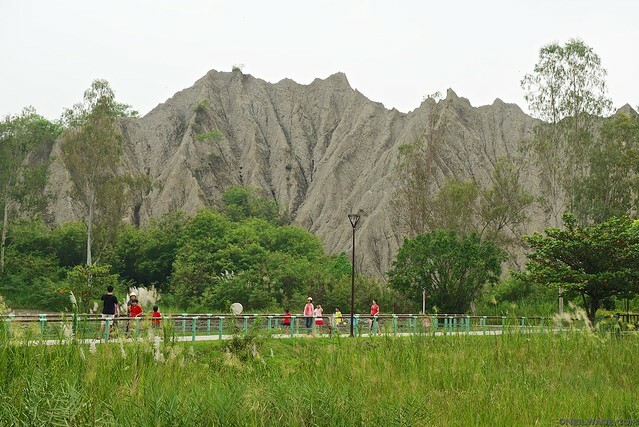 Visitors at Tainan’s Moon World walk along the main trail that visits the park’s strange geological features. 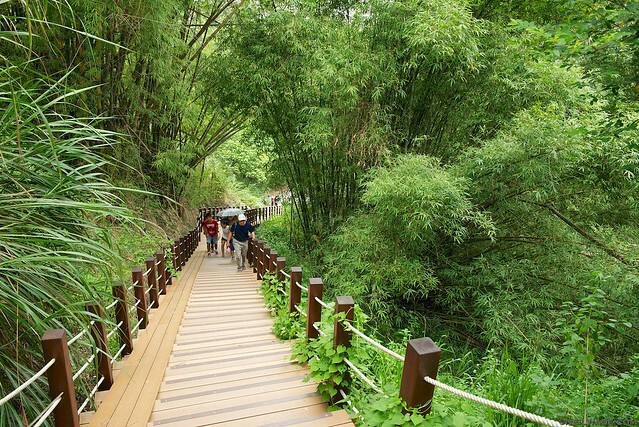 Visitor’s to Tainan’s Moon World walk through a bamboo grove along the park’s circular walking trail. 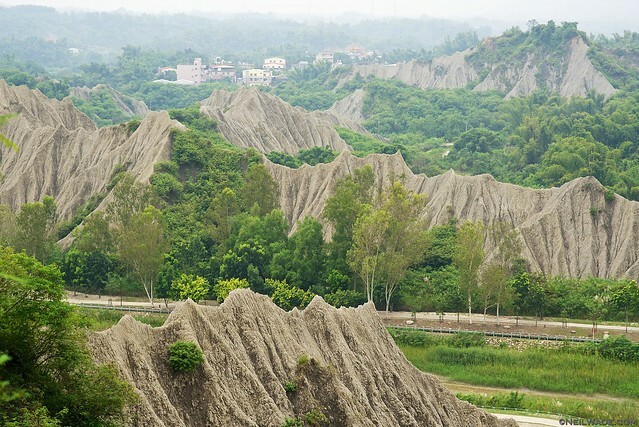 Moon world, near Tainan, Taiwan offer a very different landscape to that of the city. 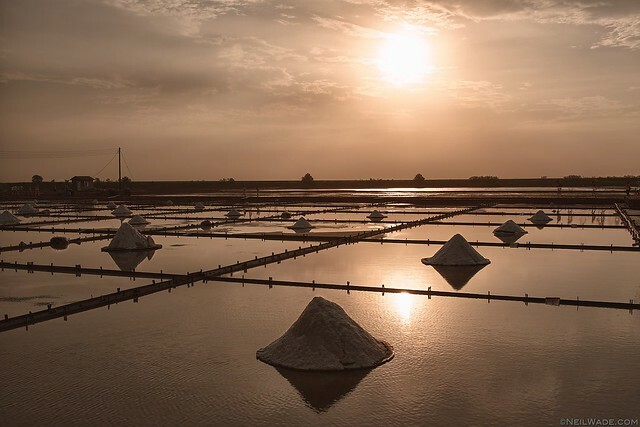 These famous salt fields can be found just to the north of Tainan, in Biemen Township. While I was again a little underwhelmed by what I saw when I arrived, the salt field do have an interesting charm to them. 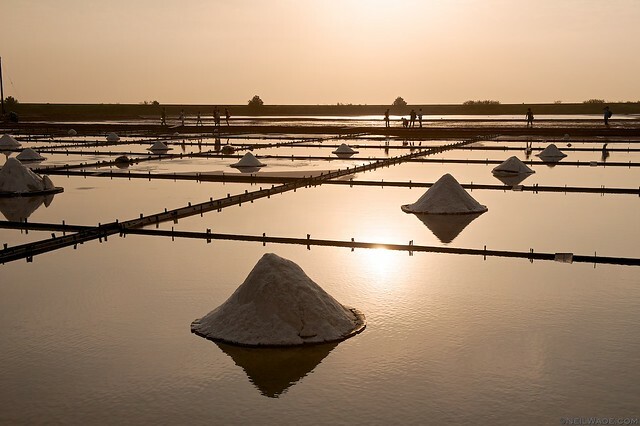 They are a living example of the traditional way to harvest salt. Basically, let the salt water come into the fields, let the sun evaporate the water, and rake up all the salt. 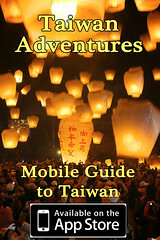 Have a look at another excellent blog Wandering Taiwan for a more complete explanation. 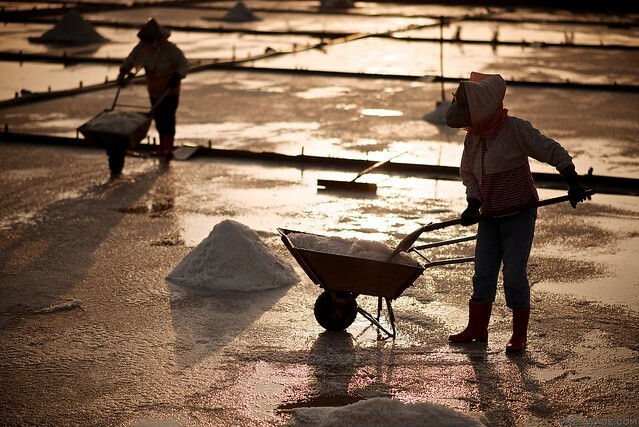 Workers collects sea salt using traditional methods at Tainan’s Jingzijiao Salt Field. 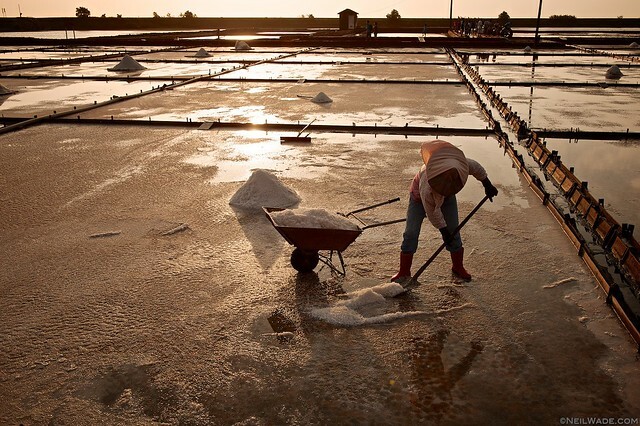 A worker collects sea salt using traditional methods at Tainan’s Jingzijiao Salt Field. 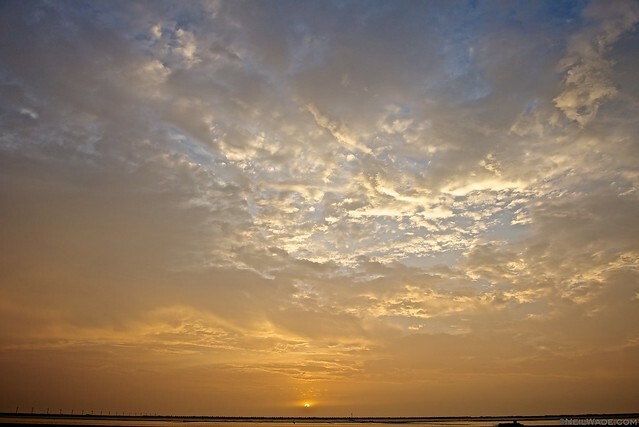 Sunset near Tainan’s Jingzijiao Salt Field. 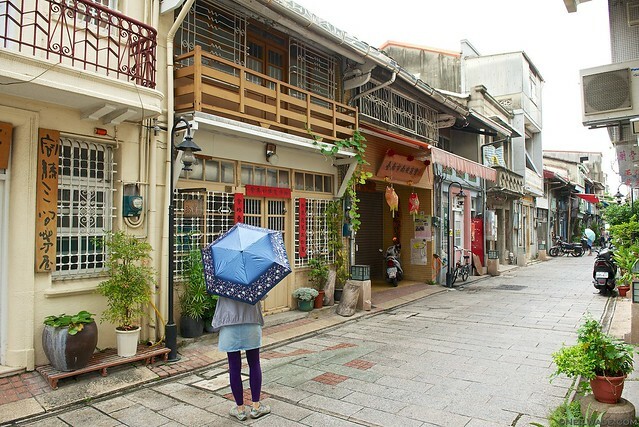 Shennong Street 神農街 is a small, traditionally decorated street in the heart of Tainan. I only spent a few minutes there but I felt that the street was (again) a little underwhelming, this time because it just doesn’t live up to its potential. At only about 200 meters long, the street has restored many of its old facades, but doesn’t offer visitors much else. There was a cafe or two, and I believe there are a few work shops that you can visit, but the street was fairly quite the day I was there. At one end is the Yaowang Temple, which starts a walking tour called the Old Five Channels Cultural Zone and visits a few temples in the area. 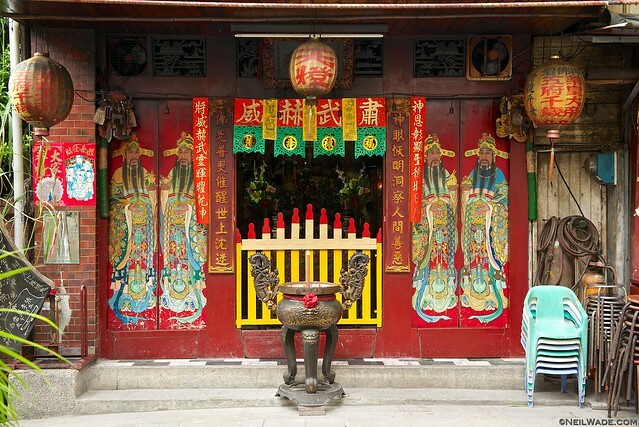 A small shrine on Shennong Street in Tainan, Taiwan. 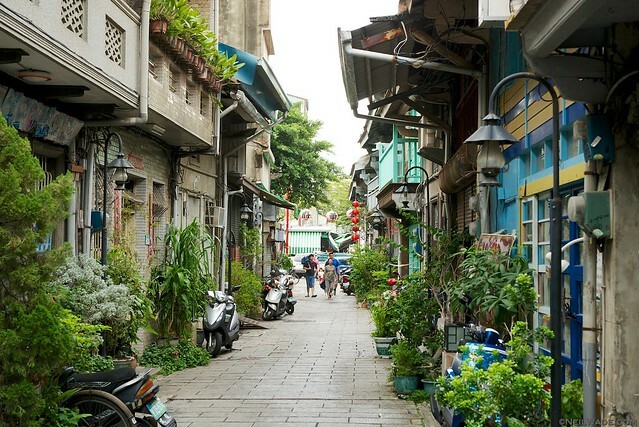 Shennong Street in Tainan, Taiwan is a throwback to old Taiwanese streets of yesteryear. 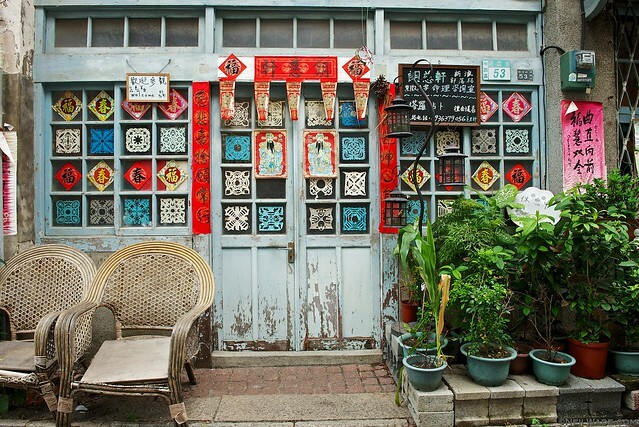 Many of the facades on Shennong Street are traditionally and/or artfully decorated. I’ll try to have that post up in a few days. Check back soon. Great photos! Look me up next time you are in Tainan, I’ll show you some out of the way places. Hey Rich, thanks! I was thinking that I should have tried to meet you or Steven at some point during this trip, but the looming typhoon had me rush around and leave a bit early. Next time!! Wow!! Gorgeous photos! Love the ‘Moon World’ ones!! I’ve always wanted to explore the Moon World outside of what can be seen from driving past it on the highway. Great shots Neil! What made you feel underwhelmed? I am now living in Taiwan myself and I have to say that for me the big issue with many of the (could be amazing) historical sites is that they seem to have become markets for cheap plastic trinkets. It makes me a bit sad because I think the Taiwanese could do a lot more to promote this beautiful island and one of the things would be to actually tell us more about the history – it’s tough to google before you speak mandarin… I often feel that I must have missed something when I visit a site in Taiwan, but would be interesting to hear if your “feeling underwhelmed” is similar to my experience. You are doing a great job in photography of this island, thumbs up for your amazing work!